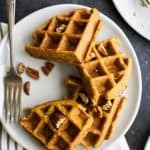 Crispy Moist Gluten Free Pumpkin Waffles made with oat flour, filled with pumpkin puree, pumpkin spice flavor then topped with a Vanilla Pecan Maple Syrup – the perfect fall breakfast! To a food processor add gluten free oats. Blend until the oats turn into a flour or powder. About 3-5 minutes. You may need to stop the food processor and move the oats around a bit to make sure they all get chopped. Remove from processor and place in a large bowl. Then add splenda brown sugar blend, baking powder, salt, ground cinnamon and pumpkin pie spice. Stir the dry ingredients together and set aside. To a medium bowl add, 3 eggs, pumpkin puree, coconut oil, vanilla extract and milk. Using a whisk, stir everything together. Pour the wet ingredients into the dry ingredients. Using a spatula combine the wet and dry ingredients until they are thoroughly mixed. Let sit for 2-3 minutes to let the oats soak up the liquid. Heat a waffle iron to high heat. Spray with cooking spray and pour 3/4 -1 cup of the pumpkin waffle batter into the waffle iron. Cook until crispy on the outside. About 3-4 minutes. While the waffles are cooking. To a small saucepan add chopped pecans, maple syrup and vanilla bean paste. Stir and bring to a simmer. Remove from heat and top each waffle with the Vanilla Pecan Maple Syrup mixture.